Click on chart to see population and growth rates by race for every state. 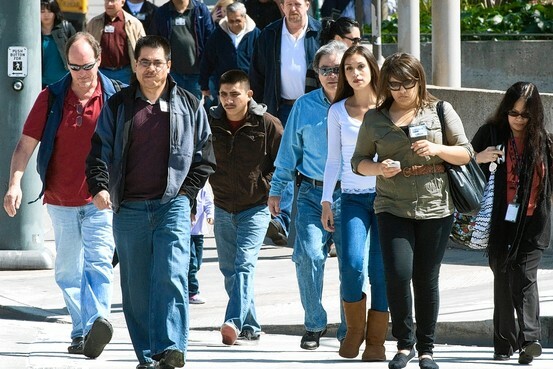 The Census Bureau—in its first nationwide demographic tally from the 2010 headcount—said the U.S. Hispanic population surged 43%, rising to 50.5 million in 2010 from 35.3 million in 2000. 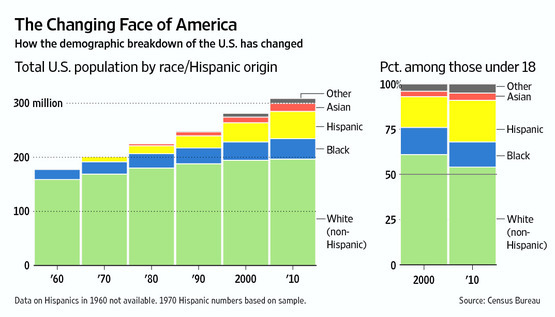 Latinos now constitute 16% of the nation’s total population of 308.7 million. The Census Bureau has estimated that the non-Hispanic white population would drop to 50.8% of the total population by 2040—then drop to 46.3% by 2050. This demographic transformation—Latinos now account for about one in four people under age 18—holds the potential to shift the political dynamics across the country. Nearly 92% of the nation’s population growth over the past decade—25.1 million people—came from minorities of all types, including those who identified themselves as mixed race. Nine million people, or 3%, reported more than one race. In addition to the 16.3% of people who identified as Hispanic or Latino of any race, 63.7% identified as white; 12.2% identified as black; 4.7% as Asian; and 0.7% as American Indians or Alaska Natives. Other races made up the rest. States in the South and West posted the sharpest growth rates during the decade, with the population of the West surpassing the Midwest for the first time. More than half the U.S. lived in the 10 most populous states, with about a quarter in the three largest states: California, Texas and New York. The Census Bureau said the population continued shifting toward the South and West, which together accounted for 84% of the decade’s population growth. The nation’s center of population—the balancing point if all 308 million people weighed the same—moved about 25 miles south to just outside Plato, Mo. In 1790, the year of the first Census, the population center was near Chestertown, Md. The Census data also showed blacks moving out of big cities in the North and into suburbs and the South, marking more black-white integration. Two cities, New York and Washington, saw their black populations decline. The District of Columbia notched its first decennial population increase since the 1940s, rising to 601,700 despite an 11% drop in blacks. But the non-Hispanic black population in the nation’s capital was just 50% in 2010, as the non-Hispanic white population jumped almost a third to 209,000. Orange County Register/Associated Press Workers in California, a state where Latino population growth has risen. New York City’s population inched up 2.1%, bringing the 2010 total to 8.2 million. The city’s non-Hispanic black population declined for the first time since 1860, according to William Frey, a demographer at the Brookings Institution. While not substantial, the 5.1 % decline is in line with other urban centers that posted declines, Mr. Frey said. New York City’s growth was fueled by increases in its Asian and Hispanic populations. The city’s white population fell slightly, by 2.8%. The increasing racial diversity among U.S. children underscored a shift that is likely to make whites a minority in the early 2040s. Of the entire Hispanic population, children make up about one-third, compared with one-fifth among whites. 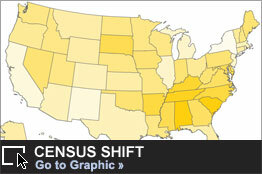 Latinos moved increasingly into such states as Arkansas, Georgia, Kentucky and Maryland. North Carolina and other states that previously had smaller Hispanic populations saw similar growth—a trend demographers say is likely to continue in the next decade. “The migration streams that have been established tend to be somewhat self-reinforcing,” Mr. Passel said. “Once a migration stream gets established to a new place, more migrants tend to go there.”Nevada grew by more than 35%, making it the only state to expand by 25% or more for the last three decades. It was followed by Arizona, Utah, Idaho and Texas.